Arkngthamz is a Dwarven ruin located southeast of Dushnikh Yal. A map marker will be added by reading a book called The Aetherium Wars, giving you the miscellaneous quest to investigate the ruins. It will also make any copies of the book a quest item until you read a journal found in the ruins. 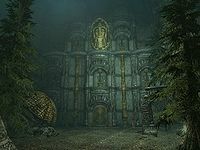 The ruins are inhabited by Dwarven automatons, Falmer and chaurus. It has only one interior zone. There is a path heading east from the Orc stronghold of Dushnikh Yal that passes Arkngthamz. Several wild animals can be found in the region including one that is usually very near to the entrance. Many juniper trees grow throughout the surrounding area. You may notice the ground shaking when nearing the ruins. These tremors continue inside the ruins as well. As noted by Katria, some of the dangers present in Arkngthamz include major earthquakes, massive chasms, and unstable ground. The ruins have suffered greatly from these. The entrance leads directly into a passage heading north, as you travel along it you will hear Katria telling you to turn back. At the end a fallen pillar provides a ramp down into a narrow, but wide chamber with a stream fed by a waterfall on your right flowing through it. Beneath which you'll find the remains of a Dwarven spiders and the first of many glowing mushrooms found throughout these ruins. At the bottom of the pillar a large doorway leads into a passage that turns east after a few more paces. There are several pillars along this passage that have been damaged by earthquakes making the floor uneven with rubble, among this are the remains of a Dwarven sphere. As you follow this passage you will again hear Katria warning you to turn back. The passage opens out onto a huge open-roofed chamber with large ledges split by a fast moving river below. The opposite ledge is above the level of the nearside ledge and has some Falmer fencing along part of the edge. This side is fairly empty and open, with stairs to your right leading up to a platform with the remains of another Dwarven spider found at the far end. From the edge of the open area you can see some masonry where possibly a bridge has fallen. The only way forward now, is a stone pillar that has fallen and is leaning against this edge and leads down to the top of a column with a dead body on top. There is a large waterfall to the left and the water runs under the wall to the right. The dead body turns out to be Katria, who died in a fall from a ledge far above and whose ghost appears next to you shortly after you first enter these ruins. On her person is her journal that provides some more info regarding the site, the forge and other important sites and at the back a few hints regarding a tonal lock. Once you read this the copies of the book are no longer classed as quest items, can be dropped and weighs as normal books. From here you can follow a broken pipe down to the water, which contains nothing of interest and a ramp that leads up to a dead end with an unlocked Dwarven chest, past the body of a dead Falmer or cross another pipe to a small tunnel. On the end of the small tunnel is another dead Falmer and beneath the grating used as flooring is a small area you can drop down into, there are two Dwarven metal ingots and a rare and prized centurion dynamo core in the space underneath, and a pipe that you can walk back up. 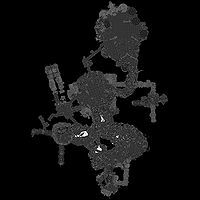 As you follow the small tunnel two leveled Dwarven spiders will drop from a Dwarven scuttle and attack. At the far end is a completely flooded room with pipes above it. There are the remains of another Dwarven sphere directly ahead. Under the water in the northern corner is an unlocked chest. A pipe can be climbed and followed up and around to a passage in the western corner. Any followers, including Katria, may be reluctant to make the short drop to the area beyond the fence at the end of the pipe, although the "wait" command can resolve this for followers and the next time Katria speaks she will reappear beside you regardless. At the end of the passage is a metal gate that keeps opening and closing as a tonal lock keeps rising and falling. Around the corner is another tonal lock and closed gate. You can activate the lock by casting a ranged spell or hit it with melee or ranged weapon. This opens the second gate. Beyond the gate is a flight of stairs leading up to a passage that is off-kilter. Around a corner is another flight of stairs with a Falmer patrolling the area. As you continue if Katria is with you, she may warn you about Falmer before they can see you. The stairs lead up to the far side of the huge chamber split by the fast flowing river. You come out at the top of stairs leading down. There is a second Falmer patrolling across the top of the stairs and a Falmer tent off to the right, which contains an unlocked Falmer chest. Another levelled Falmer can be seen wandering to the left of the tent, overlooking the drop below. There are the bodies of two further dead Falmer in this area, that can be looted. Following the front edge to the north, at far end of a narrow ledge is another unlocked chest. There is a path heading up to the south before crossing over the river and following the wall further to the south. There are several glowing mushrooms found growing on the walls and the occasional Falmer hive with Falmer that drop from them as you approach. As you continue you come to a bridge formed by another stone pillar, the path continues on the opposite side. On this side there is a closed Dwarven metal gate, that as you near, Katria will exclaim "Look, there's a chest in there. Door's sealed tight, though...". The gate cannot be opened from this side. Instead of crossing the bridge, if you walk to the end of the ledge on this side and look below you there are a couple of ledges that step down to a ramp leading up from the water, so you can either jump into the water or use the ledges to drop to a tunnel with water streaming out of it below. Entering this leads back to an area with a lot of vegetation including several hanging moss growing off the edge of an earthen ramp that leads up and around where the water exits under the rock. At the end of the stream are the remains of a Dwarven centurion and to the right up the ramp, by a broken pipe those of a Dwarven spider. At the top of the ramp is a Dwarven scuttle, from which comes a leveled Dwarven sphere. Once dealt with keep climbing the ramp to the unlocked chest Katria originally saw behind the closed gate. There is a lever that opens it to the right of it. Note it's best to instruct followers to wait before dropping down. Also when opening the gate, Katria can get stuck, closing and reopening it resolves this. Now cross the bridge, the path on the far side continues left and right. To the right is another Falmer hive containing a Falmer, unless you've already faced it and shortly after a dead end. To the left the path continues to climb before re-crossing the chamber and water below. On the far side is another leveled Falmer and possibly a chaurus. Just beyond this the path turns a corner and splits with the left-hand side continuing up and the right-hand side descending, under the path that descends is an unlocked chest. The chamber is tall, circular and flooded with deep water. Under the water, to the west is a small submerged tunnel that leads to a hidden chamber containing an unlocked wooden chest, a random one-handed weapon and shield, two coin purses—one large and one small—and a total of twelve loose septims. Following the left-hand path continuing to climb, the path then crosses the chamber one final time before entering a tunnel heading northeast with many glowing mushrooms by the mouth of the tunnel. After a short distance it turns to the northwest and then enters another chamber containing a Falmer tent and two Falmer hives. There is a chaurus or chaurus hunter in front of you and a leveled Falmer at the top of a ramp, off to the right. Inside the tent is an unlocked Falmer chest. In the rear corner of the room is a pen containing another chaurus or chaurus hunter and in front of it is a Falmer gated tunnel heading southwest. There are a few chaurus egg sacs along this tunnel and it leads to another chamber containing two more chaurus or chaurus hunters and several more egg sacs. A ramp at the rear of this chamber leads to another tunnel with water rushing along it before pouring out as a waterfall at the end into the chamber with the deep water previously passed. There is a ledge to the left of the waterfall with an unlocked Falmer chest on it and a Falmer hive above containing a Falmer that drops down and attacks. There is another ledge below you to the right, that you can drop down onto (you may suffer minor damage), and from there another tunnel with a waterfall coming out of it to the right. At the far end of this tunnel is a veil of water and behind this another unlocked Falmer chest. From this tunnel your only option is to drop to the deep water below and retrace your steps back up to the chamber containing the Falmer tent and chaurus and to take the ramp at the back. Climbing the ramp leads to a tunnel heading northeast to the huge open-roofed chamber far above where you originally entered it. 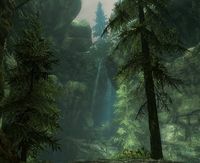 There are trees and vegetation all around, but no further Falmer, chaurus or automations (except those released for incorrect guesses). As you enter Katria will comment "Here's where I fell. Feels like ages ago." and then exclaim "Hey, there's my bow! There, out on the log. Wondered what happened to it." Hanging off the end of a large tree trunk hanging over the edge of the ledge opposite is her unique bow Zephyr, that fires 30% faster than standard bows. Once you retrieve it, Katria asks you to "Take good care of it for me." There is an earthen ramp at the rear of the chamber that leads to another that continues to climb before reaching a stone square arch. Beyond this leads out onto a ledge that descends into the final chamber. As you approach the first stone arch in this room, if you look to your left you will see another stone arch on a lower level with a skeleton, a large coin purse and iron sword on top of it, you can jump to this arch and collect the loot. Under the skeleton is also an iron shield. On a ledge that you can drop to below the entrance to this chamber is an ebony ore vein, the ledge can more easily be seen from the roof of the building in the wall to your left as yo enter. Continuing down the ramp to the other end of the chamber, there is another ledge with a quicksilver ore vein that you can drop to, and a careful jump along the wall towards the structure holding the main prize you can reach a ledge with a chest (though you may not be able to interact with it) or use at least two words of the Whirlwind Sprint dragon shout opposite, near one of the stone arches. There is another ebony ore vein near the quicksilver one that you can reach from the floor of the chamber. This room has many Falmer hives on the walls, but they seem to contain no Falmer. There is are a total of five skeletons, four of which can be looted for a few septims and the corpse of a dead adventurer with many Dwarven arrows piercing them and on the ground nearby. The dead adventurer is carrying a scrap of paper that provides some more clues to solving the correct order for the tonal locks. There are also the clues contained in Katria's journal that was found on her corpse. There is a stone square arch that is leaning over with the fifth skeleton pierced by a huge ballista bolt (These may have fallen in a heap and can not be interacted with). Using the last small ramp down and the column with the unlit brazier it is possible to jump atop the leaning arch and from there reach a ledge behind a vertical brass pipe against the wall, there is another unlocked Dwarven chest found behind this pipe. To get to the treasures including the Aetherium Shard, you have to hit the five kinetic resonators in the right order with ranged attacks to trigger the tonal locks. If you get it wrong, the ports on the front of the structure will release four Dwarven Spiders the first time, two Dwarven Spheres the second time, and eventually your failed guesses will earn you a fight with a Dwarven Centurion coming from its dock hidden behind the middle gate. After this there will be no more enemies for your wrong guesses, but the Dwemer ballista at the top of the structure will rain down bolts briefly after each wrong answer. You can avoid these by hugging the structure. The correct answer is: lower left, lower right, upper left, upper right, lower middle. This will open both the outer gates. Follow the tunnel through either door and you will see the Aetherium Shard. There is a boss level chest behind this with a further chest on the walls either side. All three chests are unlocked. To either side of the shard are triple shelves containing a mixture of various Dwemer metal items, Dwarven metal ingots and three Centurion Dynamo cores. After you collect the loot, head for the water in the west side of the chamber and take the tunnel there for a shortcut back to the lower main chamber. Save before taking the long drop to the water, though, as you or any followers could easily die if you or they hit the rocks at the end of the pool or another hard surface instead. If you are overloaded, you will be trapped by the current until you drop items where they will be difficult or impossible to retrieve. If you have windsprint, with a few tries you can land close to the right shore, deep enough to survive but close enough to get out. You can drop items there, cross to where you can climb the pipe, & retrieve them later. Arkngthmaz is erroneously marked as being in Falkreath Hold, which means quests sending you to Falkreath locations may send you here. This issue has been addressed by version 2.1.1 of the Unofficial Skyrim Patch; it has been set to be part of the Reach instead. This page was last modified on 17 April 2019, at 17:55.